If you are looking for a Water Cannon pressure cleaning system for home or commercial use, find the one that is highly suitable for home cleaning jobs only like cleaning the window sills, washing off the sidewalk and driveway, removing sludge from the chimney, general building maintenance and washing off the lawn mower and ATV. Pressure cleaners for home use can be shipped via UPS which means more affordable that those intended for commercial or industrial use. 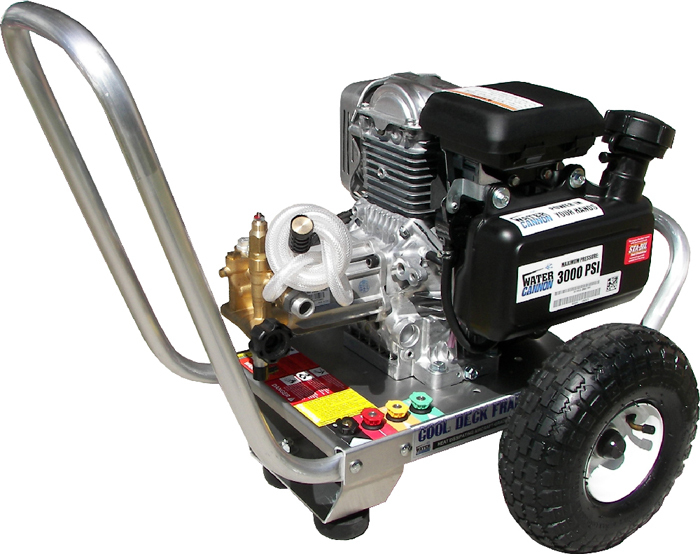 Furthermore, Water Cannon pressure washers for the home are also lighter in weight and more portable than other brands because of the lightweight aircraft aluminum frame. The engine and pump are mounted to an unbreakable lifetime guaranteed aluminum grade frame, so your power washing equipment investment will be a lasting one. The unit comes assembled, tested and ready for you to use.  Soap/chemical nozzle injector system. Water Cannon Pressure Washers from this series are packaged in UPS shipping carton. A specially designed protective carton and contractor grade two piece gun-wand assembly is included at no extracharge.